It is common knowledge that a WoW Magazine was recently released. Due to the widespread success of this endeavor, Blizzard has now released another WoW magazine, this one dedicated to the official forums. Looks like they’ve really nailed their target audience here. But what would happen if everyone got his or her own magazine? It would probably look something like this. Halloween now safely behind us, it is time to have a fun look back at the best geeky moments of our favorite holiday. Check out the Geek-O-Lanterns. Which one was your favorite? Ours was the Death Star. Ha! Freakin’ Awesome! …But there were some standouts of the low-tech variety as well. The Apple Store’s treats were really tricks. Still pretty cool though. Want to freak out the kids that come to your door next year? Just build one of these. Looks like the folks from The Today Show learned a thing or two about the dangers of drunken Ewoks. Meh, probably not but it was still the most entertaining thing we’ve seen on that show in years. It’s not every day that you see an Ewok dry-hump Al Roker’s leg. This weekend one of our team members did a lot of PVPing to pass the time while the AH was down. Now he generally enjoys PVP so we weren’t surprised to hear that this is how he spent his time but we were taken aback when he said that he found an item dropped by one of the mobs in Wintergrasp that reminded him of a girl he ‘dated’ in his college days. The drop was just a common junk item but we began to understand his meaning when he further explained that the ex-girlfriend’s name was Cyrstal. Some people feel that the US currency is boring so they’ve decided to jazz it up a bit. Taken another direction, here’s some conceptual attempts at a redesign. It wasn’t always boring though; we used to have some pretty badass currency. CNBC did some globetrotting to find what they think is the prettiest money in the world. Of course, it is what you do with it that matters most right? We’d like to see what this guy would do with a currency design. Of course, we already have a hard enough time finding our money so maybe that’s not such a good idea after all. 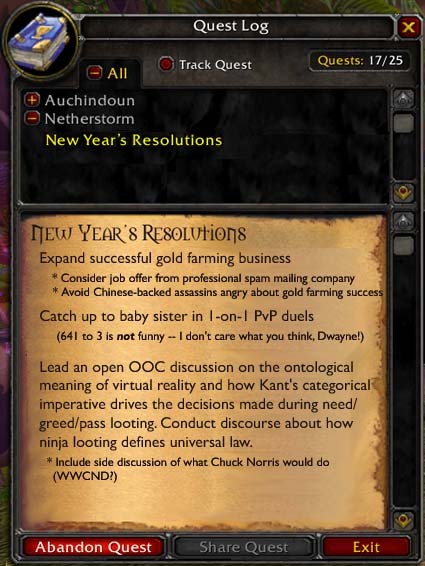 The moments where WoW and Work intersect. But apparently it is even harder being a gold farmer. Of course, the game sometimes gets in the way of work. Other times it is the game itself that feels like a job. Finally, it’s good to know that if you work hard enough you can reach the highest level. Last week on Funny Money we commented on signs of our cultural decline. This week we focus on the positive. Here’s your ‘awwwww’ moment of the week: Kids from a NY school actually improve upon an already awesome song by The Cure. Since we mention awkward, we should probably point out the most awkward moment of the year thus far: “Oh, you mean… Oh I see… So that was yesterday… Well, never mind then.” (note, probably NSFW. Not really bad but could cause your own awkward incident). Seriously though, I think that chick is in my guild. This movie just looks badass. Fellow nerds, Rejoice! You’ve been a great audience. See you next week for more Funny Money!